which, among other things, turned a formerly freeway-centric area into a green and walkable mixed-use community, with several new multi-family housing projects. 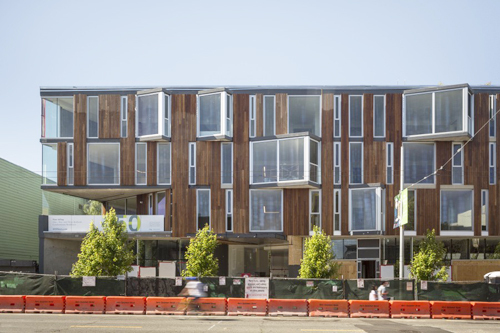 450 Hayes Street is a new multifamily housing project in San Francisco from DDG, with design by Handel Architects. First of all, it’s amazing that any project of that size made it through a politically contentious ten-year battle over whether or not to rebuild the earthquake-damaged Central Freeway. Second, the most vocal obstructionists to building new housing often seem to come out of the local neighborhood associations, who’d rather die than see ANY new housing built in their private fiefdoms. And they are often no friend of Modernism, preferring to preserve the past at the expense of the present. All this does is drive housing costs through the roof, and those who are already there can say, “Well, I’ve got mine. Go live somewhere else, even if you have to drive two hours to get to your job.” Hence our housing panel, which featured Tiny House advocate David Ludwig, affordable housing architect David Baker, housing advocate Sonja Trauss, architect Anne Fougeron, FAIA, City Planner David Winslow, as well as Craig Hamburg, who has collaborated with a number of the panelists on various projects. Unlike many other developers, who seem to be in it only for the money, Craig Hamburg and DDG, the firm he works with, seem to be genuinely interested in promoting the greater good, rather than packing the city with overpriced fake “lofts” featuring tiny footprints and cheap facades. 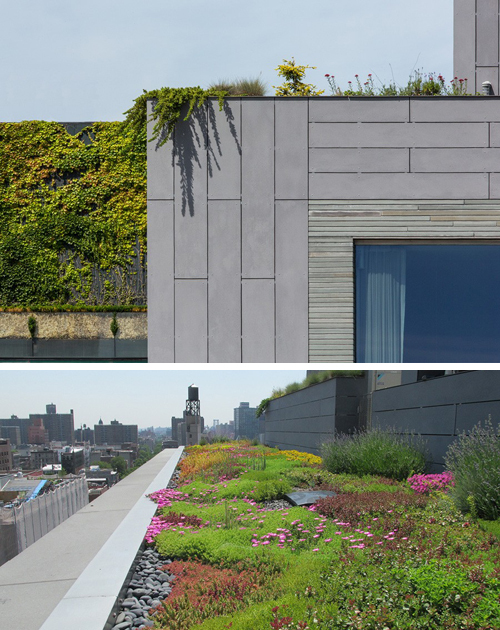 DDG’s high-end buildings in New York, San Francisco, and Florida all show a commitment to state-of-the-art housing with an emphasis on environmental responsibility: rooftop gardens, bicycle parking, bio-retention programs (stormwater treatment), keyless entry, virtual doormen, LEED certifications. One of the New York buildings, 345 Meatpacking, is LEED Silver, and some of the San Francisco projects are underway for becoming Greenpoint Rated. In their portfolio, about a third of them have won design awards in California or in New York – multiple awards, in some cases. The XOCO 325 condominium building at 325 Broadway in NYC, shown in context. 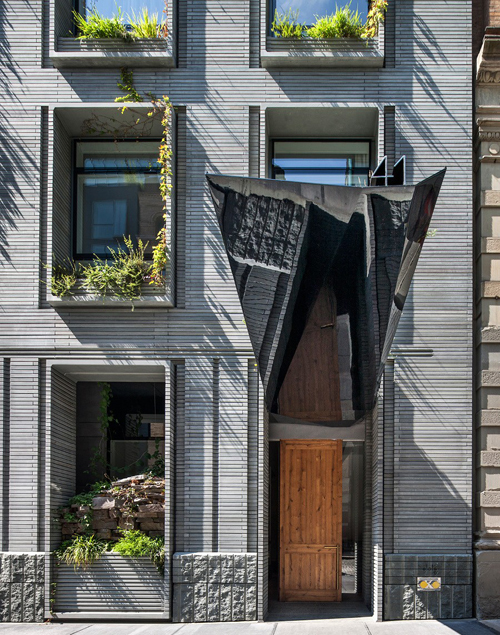 The granite-gray colors help to knit this building’s surrealist Gaudi-like sensibilities together with the surrounding buildings, also recalling the types of granite and slate found in New York State. By DDG. “I didn’t plan on becoming a developer,” Hamburg said. “I had wanted to be a doctor, because science and biochemistry were fun.” Later, at Tulane University, he majored in finance instead. “A finance degree would make me more flexible.” After graduation, he worked for a developer-builder partnership and learned about building and construction. The interior of XOCO 325 references local context in other, more subtle ways: hexagonal bath tiles are a familiar sight in many older New York buildings. 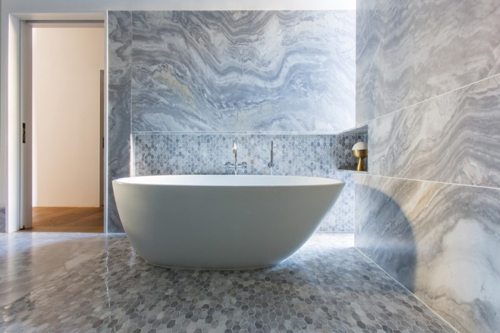 Here, the tiles are elongated and done in a dove-gray marble that also echoes the New York local stone types. By DDG. As a developer, Hamburg’s mission is “creating places that engage both residents and the community” – through context, density, and proximity to public transportation. A recurring theme at the AIA Housing panel was actually opening up buildings to the street, moving away from gated developments that cut off people from their neighbors, moving away from car culture, and creating more opportunities for people to mix in public spaces that are pleasant, walkable, and safe. What does “home mean to you? I asked the other panelists. It’s what happens outside your front door. It’s being able to walk in my neighborhood and see people I know. Knowing that my kids can safely cross the street. Biking to work, or stopping at a local coffee shop to catch up with my neighbors. Home is a communal experience. 400 Grove Street in San Francisco, looking up. Each floor juts out at a different angle, providing each apartment with its own unique viewpoint. DDG and Fougeron Architecture. David Baker spoke about creating floor plans that encouraged residents to cross paths within a building, and by having lobbies and workspaces that encouraged people to get out of their homes and hang out a little. David Winslow spoke about Linden Alley and other “living alleys” – a New Urbanist offshoot designed to transform concrete hardscapes into welcoming rest points where people can mingle, freely and safely. 400 Grove Street in San Francisco, floor plan. 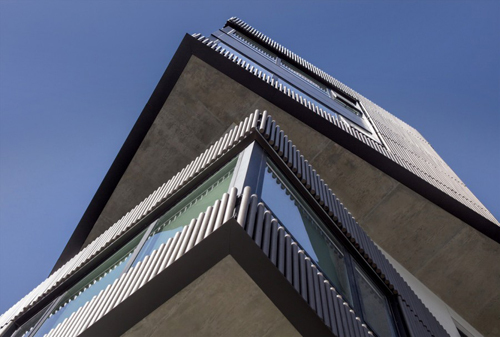 The protrusions help introduce more light, as well as adding visual interest from within and without. DDG and Fougeron Architecture. Context is the art of fitting a new building in amongst its neighbors, in a way that creates something new and exciting, but isn’t completely jarring or out of place. 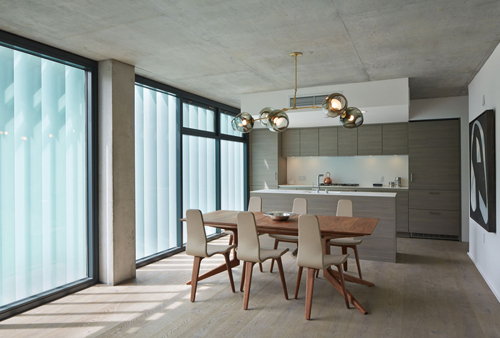 A well-designed building that’s on a smaller scale can raise the bar for other new developments, challenging the next builder to create something equally attractive. 12 Warren Street in New York City, another project from DDG, directly references the context of New York State, intentionally replicating the feel of a stone outcrop, underscoring the horizontality of layered slate with additional sculptural elements in the lobby ceiling. Even the best intentions can’t eclipse the fact that real estate is getting more and more expensive in urban cores. More people want to live in the same space, and they’ll either get priced out, or have to make do with less. 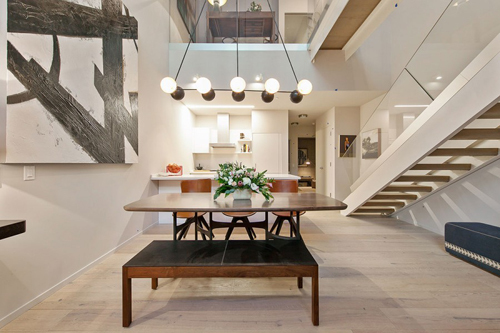 One way to make smaller floor plans bearable is placing greater emphasis on good design. 8 Octavia Street in San Francisco. DDG, Stanley Saitowitz | Natoma Architects. In a typical tract-home developer scenario, a common practice is maxing out the number of bedrooms in a single home, and cramming the maximum number of homes onto the same amount of land. The houses also seem to get bigger, but they don’t feel bigger. The developments seem barren, the detailing cheap. Whatever natural environment was there is simply razed. Even the undersized eaves provide no shade or relief from the glaring California summer sun. 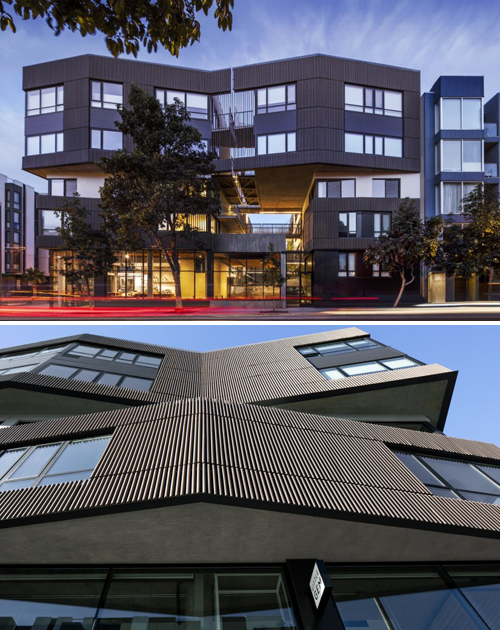 8 Octavia Street in San Francisco includes operable external louvers so that every apartment has full control over light at different times of day. 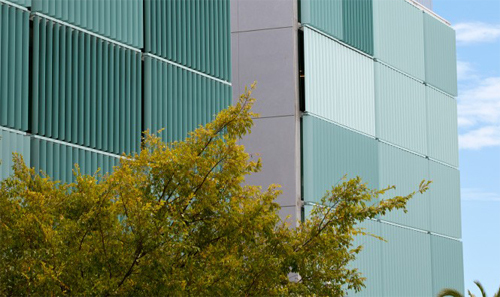 Exterior shades are far more efficient than interior ones in controlling solar heat gain, because they prevent the glass windows from heating up. DDG, Stanley Saitowitz | Natoma Architecture. As a vertically integrated company, DDG maintains a level of oversight from design through construction of its projects. Left: close-up of a carefully detailed stone for 12 Warren St in New York City. 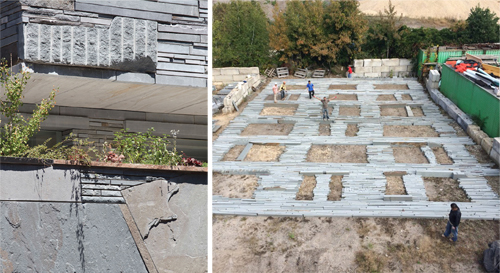 Right, the stone facade being assembled prior to shipping. DDG must feel outnumbered in a city where everyone loves to hate anyone who builds or even rents property. How does Hamburg feel about the phrase “greedy developers”? 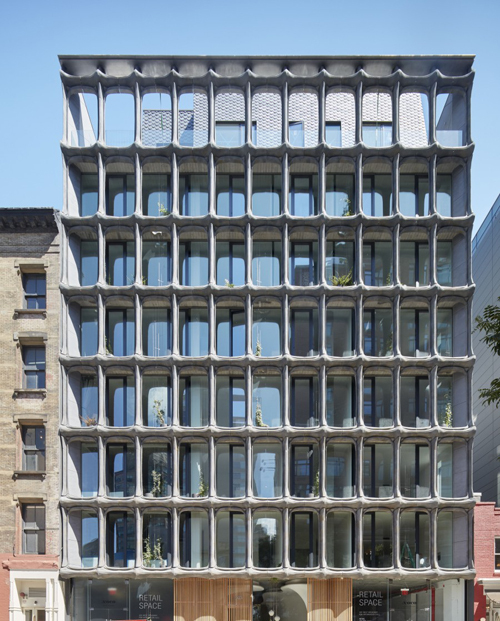 345meatpacking, a New York City housing project from DDG, draws from the context of the Gansevoort Market Historic District, and has won multiple design awards. The amoeba-shaped openings in the awning are only one detail that have made this building a designers’ landmark in downtown Manhattan. How Much Profit is Acceptable? Hamburg pointed out a tiered divide in the restaurant business that also applies to real estate. “In restaurant’s it’s either a quick and easy meal, or a white-tablecloth experience. There’s a missing middle.” This missing middle in real estate would be the middle class, who can’t afford market-rate housing, but can’t qualify for subsidies or affordable-housing options. We discussed the Hayes Valley Neighborhood Association, and how we could get other associations to be more forward-looking and less insular. Hamburg pointed to the HVNA’s origins following the Loma Prieta earthquake of ’89. Prior to that, the Central Freeway had bisected the Hayes-Octavia neighborhood, making it a lot less livable than it is today. Craig Hamburg has lived in San Francisco since 2005. He has been an HVNA board member since 2012, and currently serves as Vice President of the HVNA board. Hamburg is also on the Urban Land Institute’s Local Residential Product Council, and is a former Young Leader Steering Committee member with the United Way. Landscaping is an integral part of good design. Too often, a bloated building will try to max out interior square footage and lose all connection with the outdoors. 400 Grove Street, San Francisco. DDG and Fougeron Architecture. Landscaping: Marta Fry Landscape Associates. Several San Francisco freeways were damaged in the 1989 Loma Prieta earthquake. The Central Freeway bisected Hayes Valley. Left shows the old freeway, right shows a current map of San Francsico, with an overlay where the Central Freeway used to be. Hamburg mentioned an interesting temporary use of Parcels K and L.”PROXY is a wonderful example of temporary use on parcels K and L, and is worth mentioning.” According to Envelope A+D, PROXY is a temporary open-space for “thoughtful experimentation”, including events, shops, and a walk-in theater. Of the 22 land parcels freed up by the Central Freeway’s removal, roughly 16 are in some stage of development or completed. Lots are numbered A-V. 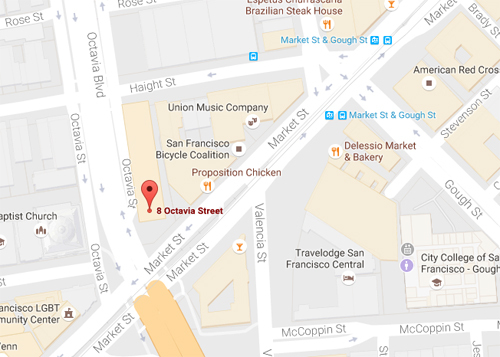 The 8 Octavia project sits at the corner of Haight Street and Octavia Boulevard in San Francisco – right where the demolished Central Freeway used to be. 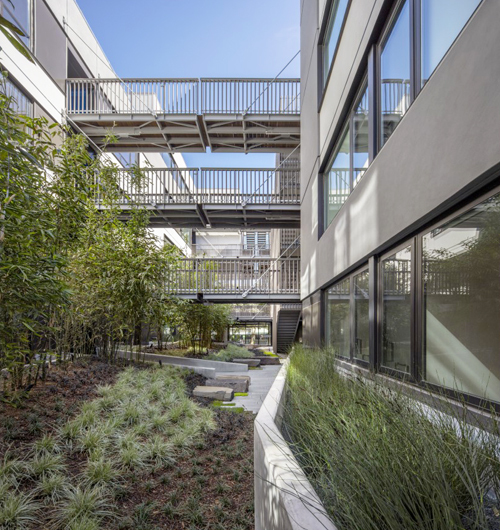 DDG and Stanley Saitowitz | Natoma Architecture. 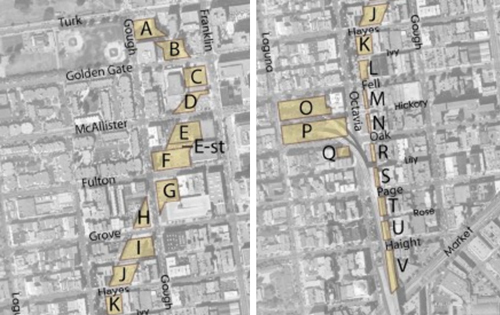 After the Central Freeway came down, Octavia Street in San Francisco was transformed into a boulevard, with open green space and walkable streets as part of the Market-Octavia Plan. The 8 Octavia project was built on land that was freed up from the demolished freeway. Sample floor plan from the 8 Octavia housing project by DDG with Stanley Saitowitz | Natoma Architecture. The bathrooms employ ingenious space-saving design techniques. 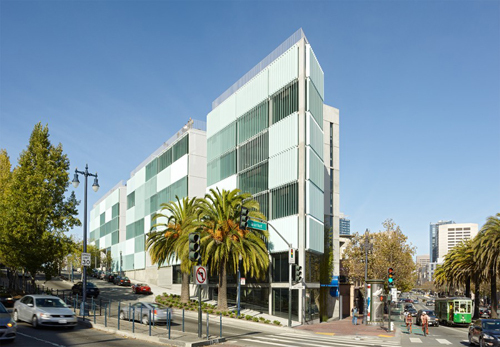 At 8 Octavia, architect Stanley Saitowitz and DDG maximized living space through the use of sliding glass bathroom doors that allowed hallway circulation to fulfill ADA requirements for wheelchair clearance. 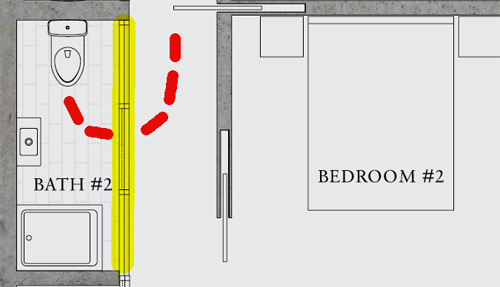 This approach allowed the remainder of the apartment to feel more spacious, while remaining fully accessible. The Stanley Saitowitz project was ahead of its time in many ways, particularly regarding interior space efficiencies. For example, some of the bathrooms are linear, only 4 feet wide, with sliding doors made from frosted glass. Traditional bathrooms have ADA space requirements allowing for wheelchair turnarounds and with minimum clearances for toilets and sinks. 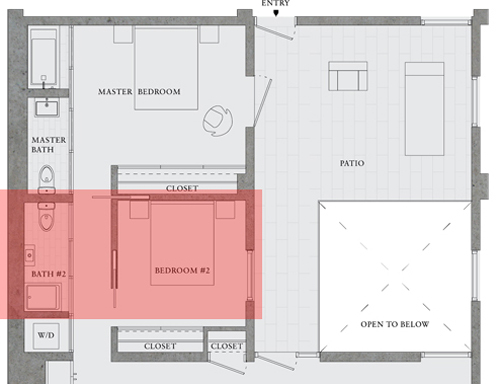 In these floor plans, the corridor doubles as ADA space when the sliding glass doors are open. The space normally consumed by a traditional bathroom is now dedicated to living rooms or bedrooms, where people spend more of their time. Hallway view of 8 Octavia, showing the bathrooms’ space-saving doors made from frosted glass. 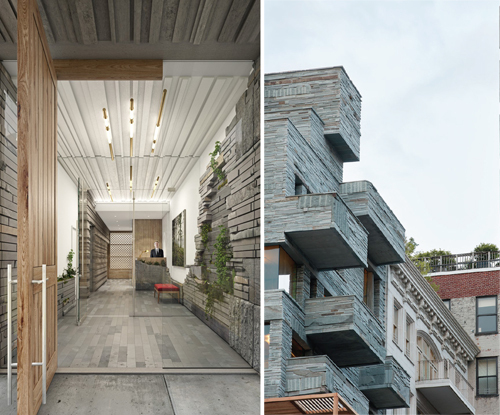 DDG and Stanley Saitowitz | Natoma Architecture. Apparently, Stanley Saitowitz’ response to micro-housing doubters is, “Have less stuff.” Although this seems daunting at first, consider how much “stuff” actually goes unused. In denser urban environments, people tend to do more activities in common areas: libraries, gyms, parks. Do you really need a home theater when a movie house is around the corner? 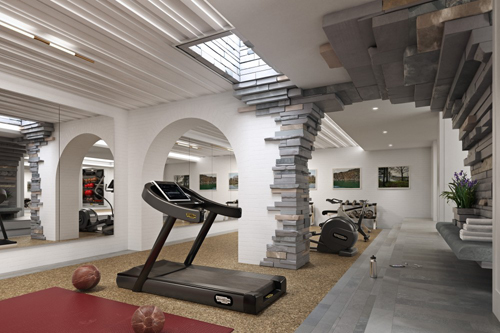 How many condos have a gym with a custom-built stone arch inside them? This is from the DDG project at 12 Warren Street in New York City. After hearing all this talk on the housing panel, everyone making so much sense and yet things are still taking 5 years to get through Planning, I wanted to know how we could hammer on a few toes. “Legislation, particularly CEQA reform, and density bonuses,” responded Hamburg. CEQA refers to the Environmental Quality requirements that, in San Francisco, have been abused by a few players who basically want NO building, NO new housing, and NO change… they’ve got theirs, and the job-seekers be damned. 400 Grove Street has a lot of life and interactivity on the first floor to engage with the public as well as the apartment residents. DDG and Fougeron Architecture. “We have 101 municipalities that don’t talk. They all want to attract jobs and tech companies, but none of them want to allow new housing. And, public transit is not unified.” AIA Housing panelist Sonja Trauss had pointed this out as well, noting how other major metropolitan areas such as New York City had unified long ago. 41 Bond Street is another example of housing design that references local context, in this case New York City. By DDG. This ties back to Sonja Trauss’ emphasis on building more housing of any kind, all kinds – and David Baker has proven that it is possible to re-house even seriously distressed populations: homeless seniors, people with mental health issues, and serve them with thoughtfully designed housing that is both supportive and cost-effective. 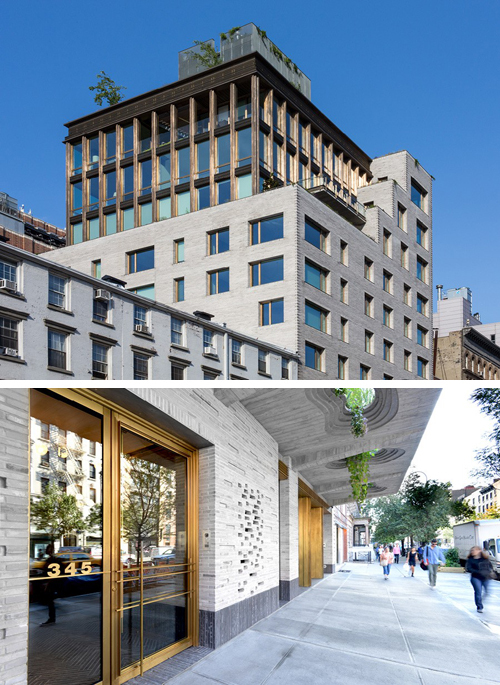 41 Bond Street in New York, like the other offerings from DDG, includes carefully landscaped plantings and a rooftop garden. 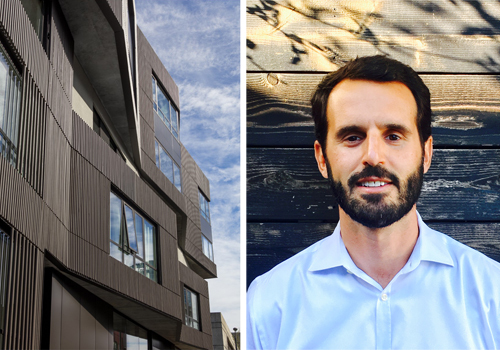 We touched upon a new housing project by David Baker Architects at 1950 Mission Street. Despite being the first 100% affordable housing to be developed in San Francisco in a decade, it has garnered objections from people who think it’s too tall, even though it’s under 10 stories.